Muhlenberg senior outfielders Justin Graf and Justin Rubenstein have been voted to the All-Centennial Conference first team for baseball. Graf (left), a second-team selection last season, hit .360 and set a CC record with 41 stolen bases. 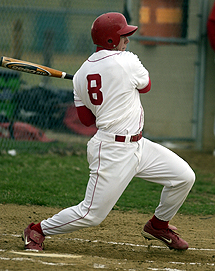 He also broke school records for runs scored (43) and doubles (12) in a season. In 18 CC games, he batted .403 and swiped 19 bases. 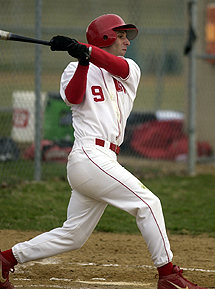 Graf finished his career second on the Mules all-time list in stolen bases (69), third in runs scored (101) and tied for ninth in hits (125). Rubenstein (right) led Muhlenberg in batting (.389), hits (a school-record 56) and RBI (34) while finishing second in runs scored (38) and stolen bases (22). He hit .438 in CC games and ranked in the top 10 in CC-only stats for batting average, runs scored, hits, RBI, doubles, triples, home runs and stolen bases. Rubenstein ended up third on the programs career list for hits (149), fifth for runs scored (96), sixth for stolen bases (35) and seventh for RBI (80). Also honored on the All-CC team were junior catcher Adam Sadler (second team), sophomore shortstop Matt Long (honorable mention) and sophomore pitcher Gregg Burkhart (honorable mention). Sadler hit .280 with a home run and 20 RBI to go along with outstanding defense behind the plate. Long hit .342 with 11 doubles, 19 RBI and eight stolen bases in his first season as a full-time player. Burkhart emerged as the Mules ace in 2003, going 5-2 with a 3.39 ERA and a team-leading 70 strikeouts in 61 innings. Muhlenberg finished the season with a 21-14-1 record and was the runner-up to Johns Hopkins in the CC playoffs.